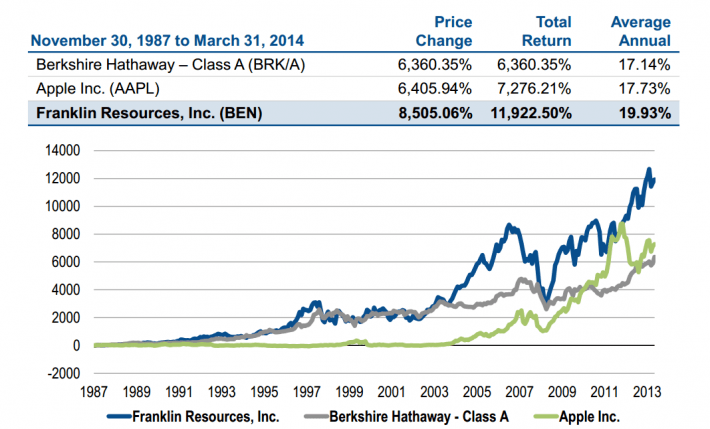 Franklin Resources, Inc. (NYSE:BEN) manages the Franklin and Templeton families of mutual funds. The company was founded in 1947 and has paid increasing dividends for 34 consecutive years. There are very few stocks that can compete with the profit generating abilities of both Warren Buffett and Steve Jobs – but Franklin Resources has done just that. The investment management and mutual fund industry has been a very good business for a long time – but… Growth is beginning to slow for Franklin Resources as the investing industry slowly shifts to low cost providers that don’t charge 1%+ of assets under management. This article explores Franklin Resources business and the status of its competitive advantage in light of new challenges. First however, let’s take a look at what some of the elite members of that investment community think of Franklin Resources. Within our database of a select group of 730 or so elite investment firms, 35 of them held 6.90% of Franklin Resources’ common stock on June 30, worth $2.09 billion. Those figures were up from 29 firms holding $2.06 billion worth of shares on March 31. While Buffett was not one of those investors, a few other notable investors did hold stakes in the company, including Mason Hawkins, Jim Simons, and Ric Dillon. Jonathon Jacobson of Highfields Capital Management held the largest stake of those 35 investors, totaling 15.87 million shares. Franklin Resources, Inc. (NYSE:BEN) is well diversified in many different way. The company’s assets under management are broken down below. Navellier & Associates’ Top Tech Stock Picks Dividend Aristocrats Part 11 of 52: McCormick & Company, Incorporated (... Hedging in the Gold Miners Hedge Fund Limestone Value Partners Is Snapping Up These Declining Stocks Does Greenhaven Associates Have A Winner (Or Five) In These Five Stock Picks... What’s The Deal With These Stocks Getting Pounded Today?